Martha's Favorites: TEA CUP CHRISTMAS TREE HOW LOVELY ARE YOUR BRANCHES! 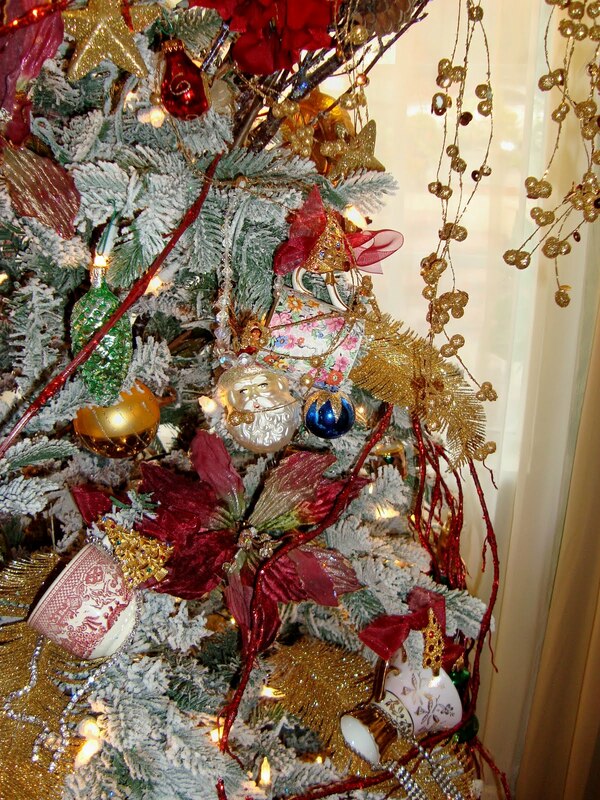 TEA CUP CHRISTMAS TREE HOW LOVELY ARE YOUR BRANCHES! Hello Ladies! Welcome to Tea Cup Tuesday No. 92. I hope you are all doing well and that your holiday preparations are well on their way. This week, I am doing something different for Tea Cup Tuesday. 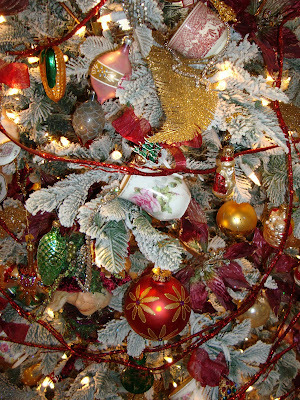 I am showing you pictures of my Tea Cup Christmas Tree. 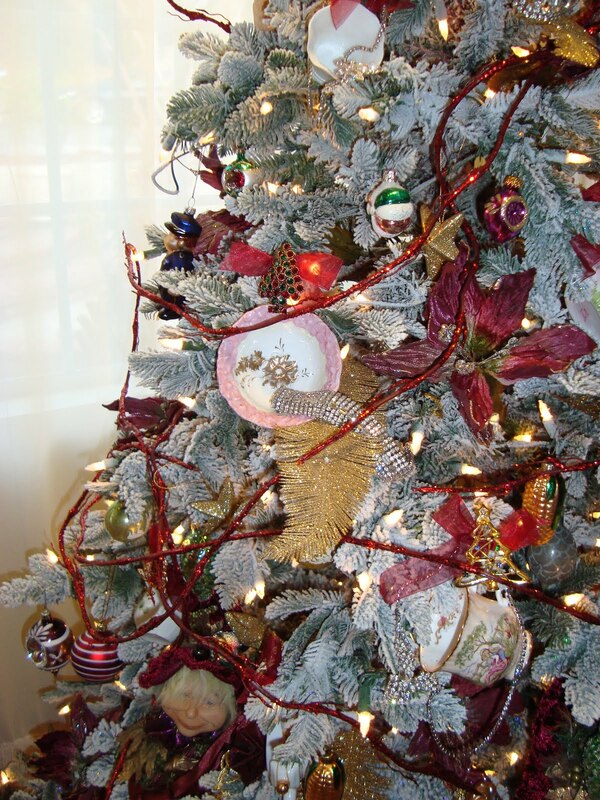 I have decorated the tree with pink demitasse tea cups. I hope you enjoy it! My Christmas Tree last year was made with vintage, Madame Alexandria Dolls. It was featured in a magazine. As you can see this year's Christmas Tree is all about the pink tea cups. This first cup is a Bavarian Demitasse Cup with an old rose print. You can also see the Staffordshire Red Transferware in this picture. Do you see the little chintz cup? It is an antique Lord Nelson Chintz cup! So cute! The pink cup with the tassel like bottom is Bavarian. This next cup is a Haviland, Limoges! Of course, my favorite designer of tea cups. This next cup is a German made. Love the pink and gold edges. I hope you have enjoyed the fun peek into this year's tree and the wonderful way you can use any collection in your home to make a Christmas Tree that is uniquely your own. Here is Mr. Linky. Please take a moment to visit Terri. She is a new Grandma and is filled to joy these last few weeks. Martha, your tree is lovely! And an original. 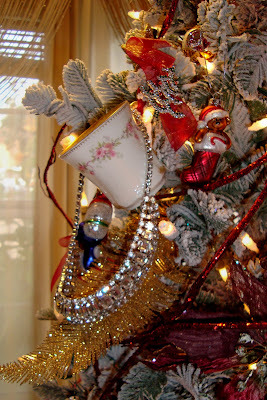 I have used tea cup ornaments, but never real ones. This year I have nothing on the tree but the tiny white lights. The simpleness is peaceful, less busy and I enjoy it. While I have tried not to buy more lately, I fell off the wagon with a tea pot. Since it is tea related I will share it this week while I have a cup/pot thing going. Have a very Merry Christmas, Martha. I have always wanted to do a tree with tea cups, and you have done it beautifully! Each cup is lovely! 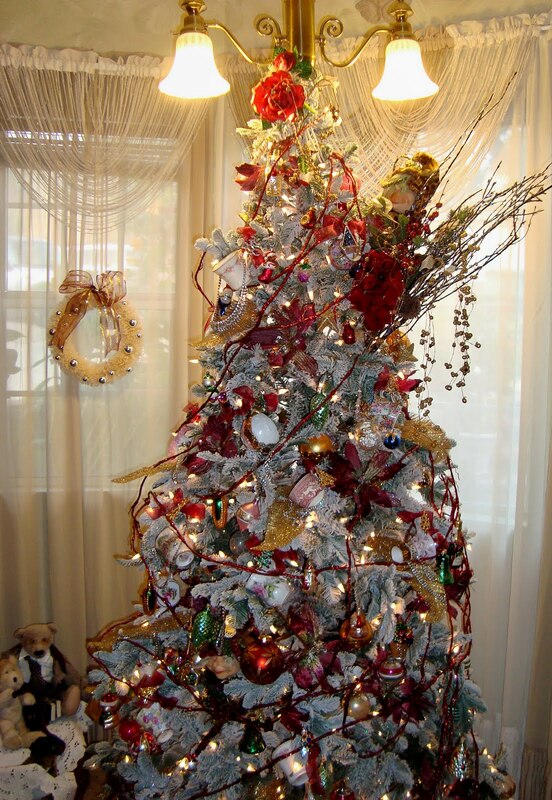 Oh my Martha, your tree is gorgeous! Real cups on your tree?! Why am I surprised?! So beautifully decorated. I have a tree with built in lights, but I haven't decorated it yet. I'm so behind since my dog, Hoku took ill. Thanks for another week of teacup sharing. Gorgeous Christmas tree dear Martha, I like it! Oh My gosh! Your Christmas tree is gorgeous, Martha! I absolutely adore it and all those gorgeous teacups in your tree are so perfect! 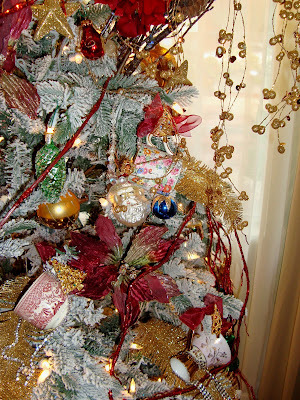 lovely christmas tree! Thank you for sharing and hosting! yes, that is the perfect Christmas tree for you. So pretty and festive. I love the cups in the tree. Thank you for sharing and for hosting this wonderful event. What a clever idea and those teacups hanging from the tree look great! What a beautiful tree. Loving the colors of it and how beautifully full it is. I may have to just do a teacup tree next year. Oh my!..,Your Christmas tree tea is a dream! 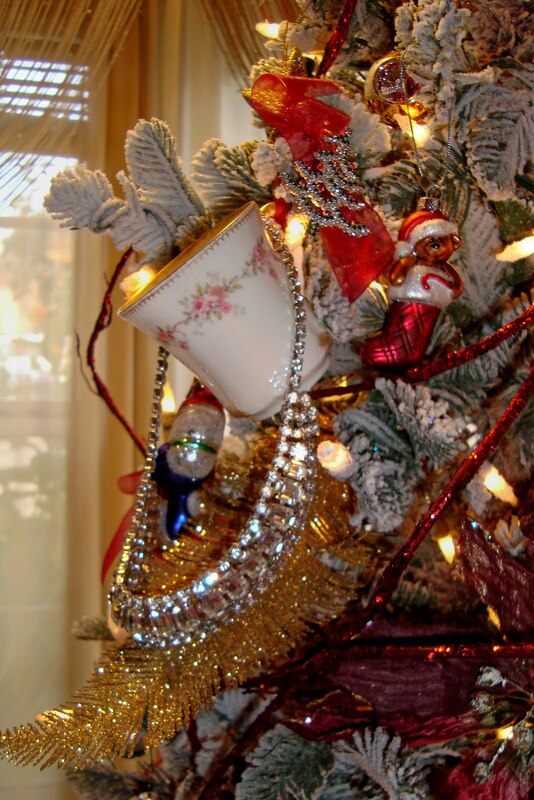 What a creative and delightful way to showcase your beautiful teacups, hanging them from the tree! It has truly been a marathon of grace growing, patience producing proportions for me in blogland these days Martha. What I fear may well look like carelessness, indifference, and time mismanagement. Is in fact, (God being my witness), is actually quite the opposite. Martha, I love your teacup tree! I didn't do one this year as my cups are either too big or too small for my trees. Next year, I will try to find a more suitable tree because I do miss having it in the dining room. Your cups are all lovely and thank you for sharing it with us. Your teacup tree is wonderful! I always wanted to do that with a tree but, I don't have enough pretty teacups. I photographed your lovely cup today. It was a good subject! Lol Have a very Merry Christmas! P.s. ~ Kindly please do always fell most welcome to link up Martha. As we fellow tea lady bloggers well know, 'the more the merrier'! 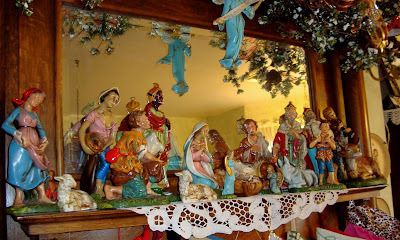 ~ I love your teacups also; I think the Christmas one is my fav, although I adore red and white transfer ware also, from last week, and the nativity scene is wonderful also. Merry Christmas dear lady! What a superb idea you had! Very original and truly you! Your tree is really full of colour and joy. 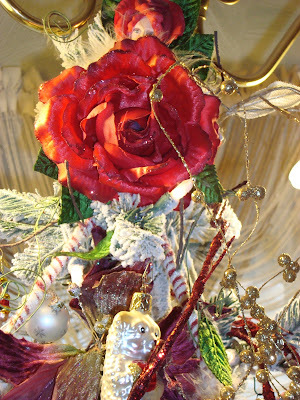 Martha - I have dreamed of creating a teacup tree - I think that will be my goal for next year! This is exquisite and inspiring! Thank you for hosting! I hope you have a blessed day! Wow! 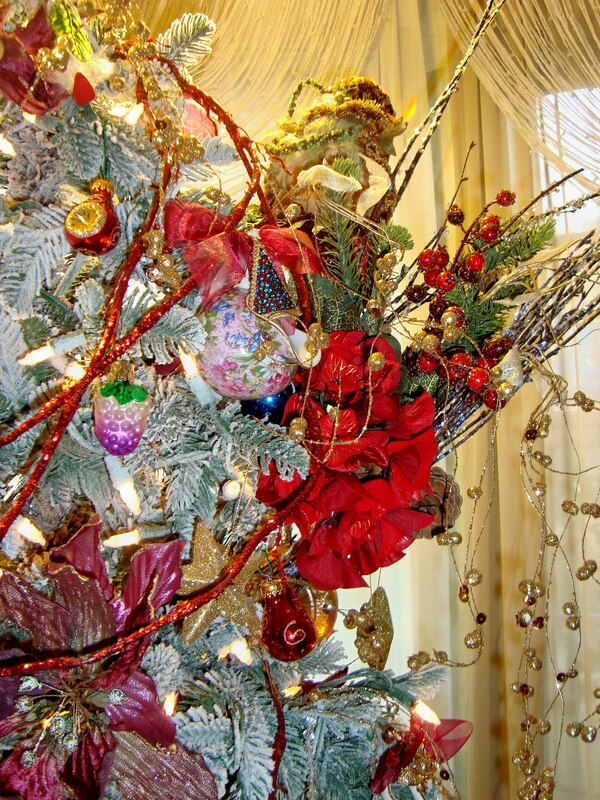 Your tree is filled with beautiful things! I like the way you used teacups...very creative! Just gorgeous photos, you obviously put so much love and thought in your decorating. It is truly fun to see. The teacups are amazing!!! Hi Martha! Thanks for visiting me. What a gorgeous tree--those teacups are the perfect ornaments! Love the tea cup tree also. Hi Martha, yes,a really beautiful tree that is fun to look at. I wish I could see it in person as I'm sure it is even more special. I love your nativity too and your message reminder. and of course to check out the teacups. Be blessed. Love your decorations and all the lovely teacups. Thanks for visiting my blog and being a follower. Christmas Blessings. WISE MEN & WOMEN STILL SEEK HIM!